Should an emergency arise with any electrical components, you will receive priority scheduling over non-members. This includes nights, weekends and holidays. 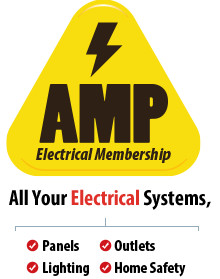 AMP Members enjoy up to 15% discounts on electrical repairs and services. As always, Abacus offers flat rate pricing, which means we will tell you the cost in advance. So, you don’t have to watch the clock or worry about surprising overtime fees. A certified, state licensed Abacus electrician will perform a multi-point electrical safety check once per year on your home. And Abacus will keep track of scheduling your inspection for you. AMP inspections keep your homes electrical systems operating at peak efficiency, but may also detect potential problems that can be corrected inexpensively before major damage occurs. Most manufacturer warranties require licensed technicians to perform any repairs or installations. By using Abacus’ licensed electricians, this will help protect any warranties that may exist. Main Panel Boards: We inspect the Main Electrical Panel/Load Center to ensure the wire connections on the breaker are properly torqued (tightened) and the breakers are properly connected to the buss bars. The screws connecting the wire to the breakers can become loose over time. We also use thermal imaging to identify any hot spots on the breakers and connections. Arc Fault Breakers: We inspect the ARC Fault Breaker for proper function and safety. GFCI Protection (Ground Fault Circuit Interrupter): We inspect all receptacles that need GFCI protection are protected. Receptacles (Interior): We inspect all receptacles for reverse polarity, missing ground and correct wiring. Receptacles (Exterior): We inspect all exterior receptacles for proper GFCI protection and proper cover protection as required by the latest National Electrical Code. Smoke Detectors: We inspect all smoke and carbon monoxide detectors for proper interconnect operation and replace the batteries FREE of charge if needed. Lighting: We inspect all lighting fixtures (visual inspection). Security Lighting: We inspect any security lighting you may have. Timers: If you have an electrical unit on a timer, we will adjust for daylight savings time. Surge Protection: We inspect your home for proper surge protection and/or recommendations. Back-Stabbed Connections: We inspect Back Stabbed Connections, which can be a serious fire hazard.